HCA is an alternative cut rating tool mostly used by web-based diamond traders and shoppers as it is easily accessible online. 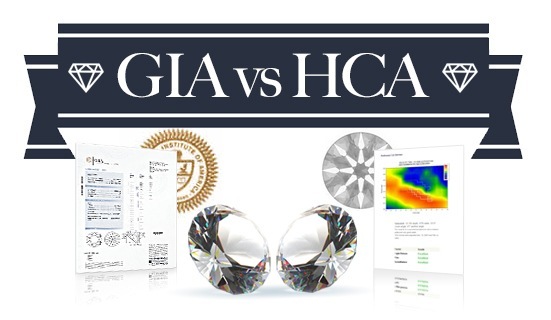 Compared to the more renowned diamond grading entities like EGL and GIA, HCA is a cheaper way to rate the cut of a diamond. HCA works by estimating a diamond’s potential light return, scintillation, fire, and spread after utilizing some basic information regarding a diamond. This information includes overall depth percentage, average crown height or angles, table percentage, average pavilion depth or angles, and culet size. As per countless observations of gemologists in the industry, there are setbacks to the Holloway Cut Advisor that need mentioning. For one, there are many standards not accounted for by HCA cut rating. These include craftsmanship, cut precision (traditional symmetry), digging and painting, among others. In addition, the HCA process is entirely dependent on computer models. No living person ever rates the diamond based on its actual appearance. 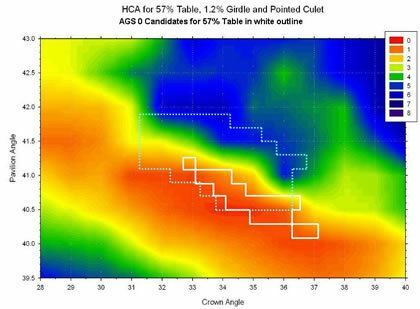 It is important to note that HCA ratings are often inconsistent—sometimes rating two identical stones differently, which raises serious questions about the algorithms used by the HCA computer models. In contrast to the limited attributes used by HCA, the GIA Cut Grade rating has three major criteria which cover a more comprehensive list of quality indicators. These include face-up appearance, craftsmanship, and design. With face-up appearance, standards like brightness, scintillation, and fire are measured. Craftsmanship looks for details regarding symmetry and polish. And design delves into durability and weight ratio. Cut ratings include Poor, Fair, Good, Very Good, and Excellent. These grading standards are obviously more descriptive, thus easier to interpret. Furthermore, GIA grades diamond cut via a predictive computer model which takes into account approximately 38.5 million proportion indicators and at least 70,000 specific diamond quality observations. This breakthrough system is just one of the many practices and technologies that gives GIA Cut Grade more credibility. Admittedly, the use of such a reliable system is also the reason why a GIA diamond certificate costs a little more, and why the company has strict standards when it comes to grading diamonds. The final advantage to a GIA examination is the human factor that comes from a real gemologist putting their eyes and hands on the diamond to ensure that their computer analysis didn’t miss a thing. What better way to confirm the quality of a stone than by actually seeing all of the characteristics that make it great? In the end, for the most discriminating and discerning buyers, the tried and tested GIA Cut Grade is still the most sought-after and reliable guarantee of cut quality.